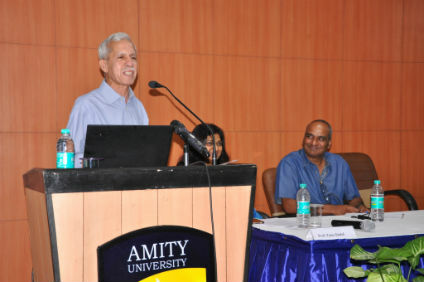 New Delhi: To commemorate ‘Ozone Day’ and ‘World Environment Health Day’, Amity Institute of Environmental Toxicology, Safety and Management (AIETSM) and Amity Institute of Environmental Sciences (AIES) organized a Workshop at University Campus, Sector 125 Noida. The aim of the workshop was to sensitize students about the importance of environmental protection through Ozone and also concerns for safety of environment and public health. Prof. S. V. Eswaran, Emeritus Scientist in UNESCO’s funded Regional Centre for Biotechnology and Prof. R Bhaskar, FGS, Department of Environmental Science & Engineering, Guru Jambheshwar University of Science and Technology, Hisar were present during the occasion. Welcoming the guests, Prof. (Dr.) Tanu Jindal, Director, AIES & AIETSM apprised that the World Ozone Day commemorates the date of the signing of the Montreal Protocol on Substances that Deplete the Ozone Layer in 1987. She further added that this year marks as the 30th anniversary of Montreal Protocol and the theme is ‘Caring for all life under the sun’. Dr. Jindal briefed about ozone layer depletion, indoor air pollution, implication of chemicals and health impacts. She stressed that as per WHO report, poor quality air affects more than 80% of the world’s population. She highlighted that 11 of the common air pollutants are higher inside than outside and higher health risks are there since most of the people spend 98% of their time indoors. Addressing the gathering, Dr. (Prof.) S V Eswaran briefed about Paris Agreement and said that to address climate change, countries adopted the Paris Agreement on December 2015. He mentioned that in the agreement, all countries agreed to work to limit global temperature rise to well below 2 degrees Celsius. Dr. Eswaran apprised about UN Sustainable Development Goals which are about enabling environment of peace and security through rule of law and conditions for inclusion and participation and advised students to understand these goals thoroughly. He averred that it is important to learn from nature rather than tempering it for non sustainable development. Speaking on the occasion, Prof. R Bhaskar said that humans have been alternating the chemistry of the atmosphere on a global scale. He pointed that these changes are creating numerous environmental threats such as Ozone Depletion, Acid Rain and Climate change. He apprised that the earth’s protective ozone layer is well on trade to recover in the next few years but equal contribution from every country is required. He further added that the increasing complexity of the environmental problems requires an enhanced capacity for scientific awareness, assessment and monitoring. Prof. Bhaskar stressed that it is necessary to sensitize people about the importance of our environment right from the primary level. He opined that public awareness, participation and political will of the government can together bring about the desired change. During the occasion, students of Amity Institute of Environmental Toxicology, Safety and Management (AIETSM) and Amity Institute of Environmental Sciences (AIES) participated in the exhibition of photographs on theme ‘environmental issues’.